Call us today to use our printers or for other printing services! 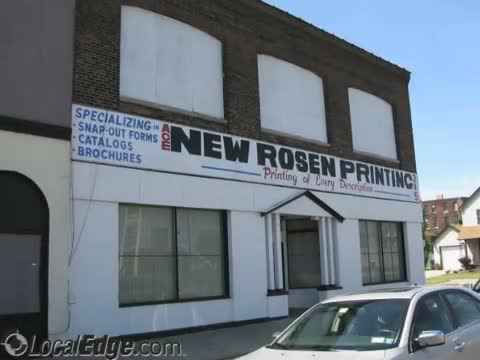 Looking for reliable printing services for the Buffalo, NY area? Choose the printers at Ace Printing CO for all your needs. From business cards and letterheads to books and programs for special events, we will meet all your preferences and needs! For over 6 decades now, Ace Printing Co. has been loyally serving the residents of the Buffalo, NY region. Our business is family owned and operated, and offers comprehensive photo offset, digital and letterpress services. Our printing services can make your print materials look fantastic and professional. Really, no matter what your printing needs may consist of, we've got you covered every step of the way! At Ace Printing Co, we provide heavy duty printers that can fulfill all your prints needs. We can provide printing services for a simple flyer or even a full fledged program or brochure. Our printers are capable of full color services and can be tailored to suit all your specific requirements. We use the Best Printers for the Best Results! To learn more about our printing services and how we can assist with any of the following services above, stop in or give us a call today. Our printers are capable of any project and we are more than happy to meet your needs. We look forward to serving you and the rest of the Buffalo, NY area! We use only top-brand printers to provide you with flawless, clear prints. When it comes to printing services, we are the best in the area. We offer great value for money, and you can rely on us if you have large printing orders for your business needs. We serve clients in Buffalo, NY and the surrounding areas. We use high-quality printers to give you results you’ll be proud to show to everyone. Visit us today! Our printing services are especially helpful for local businesses! Allow our staff members to help you create a digital representation of your company that can be printed off in all sorts of formats! From brochures and pamphlets to business cards and flyers, our print services will help you create and actualize a digital representation into a print representation of your company. We have great pricing options for each product as well. All of our products come in a variety of separate colors, stock options and designs. We also offer our clients extensive delivery options and services. No matter which printing services you currently require, don't hesitate to give us a call today. Offering Professional Photo Offset Printing at Your Convenience! Photo offset printing is a printing technique that is commonly used with high quality prints. The inked image is transferred, or "offset," from a plate to a rubber blanket, then to the printing surface. When used in simultaneously with the lithographic process, which is based on the repulsion of oil and water, the photo offset technique employs a flat (planographic) image carrier on which the image to be printed obtains ink from ink rollers, while the non-printing area attracts a water-based film (called "fountain solution"), keeping the non-printing areas ink-free. Compared to other printing methods, offset printing is best suited for the cost-effective production of large volumes of high quality prints. Offset Lithography has traditionally been used to create a large array of printed matter. Photo offset printing is still commonly used in the printing applications of newspapers, magazines, brochures, stationery, and books. It requires very little maintenance, is quick and easy to utilize, and produces a consistent, high quality image. Our photo offset printing services are extremely reliable and affordable! In most cases, vendors will stress the total cost to operate their equipment, involving complex calculations which include all cost factors involved in the operation as well as the capital equipment costs, amortization, etc. With Ace Printing, however, all clients are granted highly competitive rates on the very best services. We don't think you need to empty your wallet to gain the finest printing services available! Our printing services staff retains countless years of experience in the printing industry, and loves serving the entire Buffalo, NY community! We take great pride in all the printed material we produce, and offer our printing services in a prompt and efficient manner. Dial (716) 853-3809, and allow our printers at Ace Printing Co to create your wedding invitations, newsletters and more today! Business forms in both carbon and carbonless are our forte!! Business cards, letterheads, envelopes, programs, newsletters, wedding invitations, books, bumper stickers, full color printing. brochures, ticket, statements, band posters, catalogs, obituaries, souvenirs, souvenir journals, CD covers, and we now have a full line of buttons. We now feature digital printing as well as photo offset and letterpress. Digital printing accounts for approximately 9% of the 45 trillion pages printed annually (2005 figure) around the world. Printing at home or in an office or engineering environment is subdivided into: small format (up to ledger size paper sheets), as used in business offices and libraries; wide format (up to 3' or 914mm wide rolls of paper), as used in drafting and design establishments. Blueprint - and related chemical technologies. Daisy wheel - where pre-formed characters are applied individually. Dot-matrix - which produces arbitrary patterns of dots with an array of printing studs. Line printing - where pre-formed characters are applied to the paper by lines. Heat transfer - like early fax machines or modern receipt printers that apply heat to special paper, which turns black to form the printed image. Inkjet - including bubble - jet - where ink is sprayed onto the paper to create the desired image. Xerography - where toner is attracted to a charged image and then developed. Laser - a type of xerography where the charged image is written pixel by pixel by a laser. Solid ink printer - where cubes of ink are melted to make ink or liquid toner. Vendors typically stress the total cost to operate the equipment, involving complex calculations that include all cost factors involved in the operation as well as the capital equipment costs, amortization, etc. For the most part, toner systems beat inkjet in the long run, whereas inkjets are less expensive in the initial purchase price. Professional digital printing (using toner) primarily uses an electrical charge to transfer toner or liquid ink to the substrate it is printed on. Digital print quality has steadily improved from early color and black & white copiers to sophisticated color digital presses like the Xerox iGen3, the Kodak Nexpress, the HP Indigo Digital Press series and the InfoPrint 5000. The iGen3 and Nexpress use toner particles and the Indigo uses liquid ink. The InfoPrint 5000 is a full-color, continuous forms inkjet drop-on-demand printing system. All handle variable data and rival offset in quality. Digital offset presses are also called direct imaging presses, although these presses can receive computer files and automatically turn them into print-ready plates, they cannot insert variable data. Open evenings til 5:30 PM.